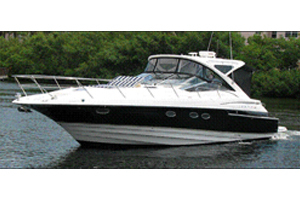 Looking for a weekend runabout, around the South Florida waterways or even the Bahamas? Consider K&A Charters. From the Florida Keys to West Palm Beach, you can count on K&A Charters for the finest charter boat fleet in South Florida. Starting from the stern, the fishing cockpit is huge. It is thoughtfully covered with a large top to keep you cool and shaded from the beating Florida sun. Forward of the cockpit, there’s mezzanine seating so guests that aren’t fishing can get a bird’s eye view of all the action. The flybridge offers spectacular views and features another huge space for guests to relax and lounge in true VIP comfort. The helm features a brand new state of the art electronics and navigation package giving the captain an unfair advantage to find where the fish are hiding. The bridge deck is high and dry and is truly the place to be on the ride out. Just forward of the fishing cockpit, you’ll find the beautifully appointed main salon where there’s a ton of space for entertaining. There’s a large leather sofa, flat screen TV, dining area and galley (kitchen). Down a flight of stairs are three staterooms, accommodations include a huge master stateroom which features a private den appointed with a leather couch, bookshelves and a flat-screen TV. The second spacious stateroom is to starboard and is equipped with another private head. Forward is the third stateroom offering comfy V berth accommodations. Many of our clients want and need more than just a fishing boat when they’re entertaining their guests and this magnificent sports fishing yacht is the perfect platform to do just that, mission accomplished! 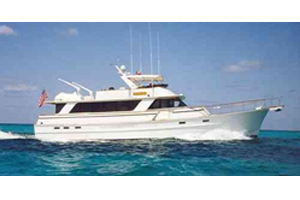 This 79’ Beaux with her classic yacht lines makes a perfect yacht for cruising and entertaining your guests. Once aboard, you find creature comforts topside and below. Her covered bridge deck is the perfect place for sightseeing. Below you will find the very spacious main salon and full galley area, featuring a side by side refrigerator freezer. Of course, you will enjoy your favorite reggae music, sporting event or video movie courtesy of the built-in entertainment center, full bar and salon seating area. The distinctive Sealine 51′ Sedan Bridge is luxurious and comfortable She features a spacious bridge with ample seating for 12. 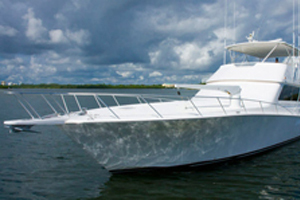 Experience the tropical waters of South Florida aboard our 51-foot luxury yacht. The Sealine T51 is perfect for a day on the bay. Your day will include cruising on the water, swimming in the blue waters of Biscayne Bay, Jet Ski in the bay and tanning on the spacious tanning beds either on the bow or the flybridge. Your Captain will anchor the vessel, then launch the jet ski, you will be given snorkel gear if you would like. The water is clear and relatively shallow for a great swim! Bring your iPod, your own CD’s, tanning lotion, and your sunglasses! Perfect for half day and full day charters of up to 12 passengers, this 2008 45′ Regal Commodore Sports Yacht is fully equipped to surround her guests in the unmistakable luxury. The interior provides unmatchable comfort with two full staterooms, fully equipped galley, luxurious salon and complete entertainment center. 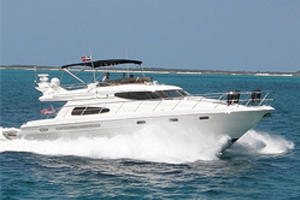 With amenities such as the latest in marine electronics, air conditioned helm area, Volvo IPS propulsion system, high-end stereo equipment, spacious covered aft deck and bow seating areas, the exterior of the 45′ Regal Commodore Sport Yacht is the perfect place to enjoy the warm and inviting waters of South Florida with friends and family. 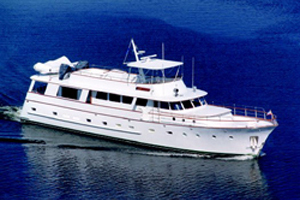 Customized luxury yacht charters are proving to be a popular and affordable option for many. Whether you are veteran yachtsman or a person who may never have tried yachting before, Fastrack Sports Yachts are comfortably sized for groups of various sizes and staffed with professionals trained to provide guests with a safe, comfortable, and enjoyable experience on the water. Step on board the “Secret Love” and leave the cares of the world behind. Plan a company outing, an evening dinner cruise or a private weeklong vacation on this luxury 80ft Fly Bridge Motor Yacht. From “Secret Love” you may choose to explore quaint Islands or enjoy swimming, fishing, snorkeling or kayaking. You may entertain clients or mingle with friends over sumptuous buffets. Or you may just sit back and relax with your family. “Secret Love” cruises the New England coast during the summer. During the winter, “Secret Love” explores the coast of Florida and the Islands of the Bahamas. In either area “Secret Love” creates special memories you will treasure forever. Indulge yourself. Join the crew for a short or long stay aboard “your” yacht. Is a southern barbecue afternoon transitioning to starlit skies? A Moet toast to the happy couple? A Thank-You to the entire board of Directors? Your wish is more than merely our command, it is our command. It is our commitment. We put it all at your disposal. Step aboard the Secret Love and play gracious host. We empty the ashtrays and clear the crystal continuously, laying a perfect backdrop for any event or gathering, intimate or extensive. Serve food and attention in classic, nearly invisible style, with lots of room for guests to appreciate. The Secret Love is United States Coast Guard certified for 65 with plenty of twirling room. That’s Secret Love at your service.